It’s a common scenario: Research is shared via journals or at conferences, but rarely do scientists relay those results outside of their academic niche. And almost never do they explain findings to the public at large, even though public tax dollars often fund research. With this precedent, coupled with a lack of effective communication training, the sharing of one’s passion with lay audiences can be difficult. Not so for Kathy Spindler, Ph.D.
“It’s important and satisfying to make science accessible to a wide audience,” says Spindler, a virologist who researches how viruses can cross the blood-brain barrier and cause brain swelling among mice. From in-depth coverage of the Ebola epidemic to a current focus on the Zika virus, the program examines research in an engaging and insightful manner. 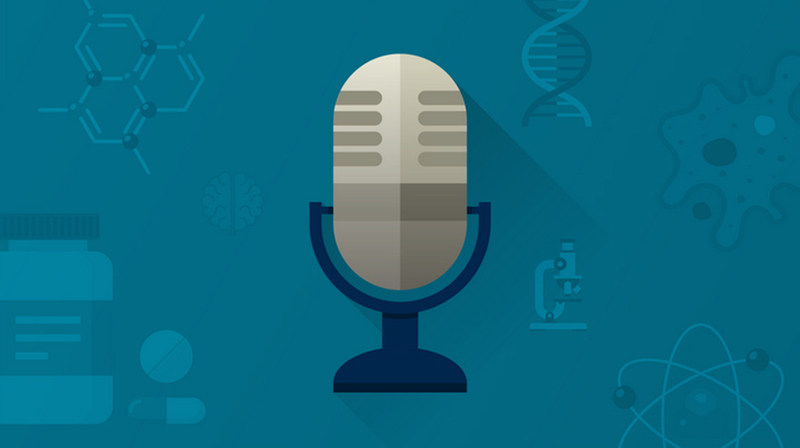 The podcast was launched in 2008 by virologist Vincent Racaniello, Ph.D., and parasitologist Dickson Despommier, Ph.D., both of Columbia University. Funded by Racaniello, “TWiV” has tackled a number of tough topics in a timely fashion while on the air. Subjects might be complex, but the presentation isn’t. And that’s by design. Her listener base, as such, includes students, teachers and retirees — those with careers in microbiology and non-science professionals alike. Many, too, engage with the hosts through letters, comments and social media. Underscoring the wide appeal are the show’s “all-email” episodes that highlight and answer correspondence from around the world. On campus, Spindler isn’t alone in her pursuit. Racaniello also created “TWiM” (which, unlike Spindler’s show, is released biweekly) to expand the breadth of topics covered to all things microbiology — with a lot of coverage of bacteria. Swanson, a professor of microbiology and immunology, has established herself as a successful bacterial pathogenesis researcher. One pathogen she investigates, the bacterium Legionella pneumophila, is the cause of Legionnaires’ disease, which has recently plagued the area around Flint, Michigan. A frequent focus for Swanson, Racaniello and other “TWiM” hosts is dissecting the latest research on the human microbiome — the study of the communities of bacteria that inhabit our bodies — including related U-M work. A recent meeting held at U-M also provided rich fodder for discussion. It’s no surprise, then, that both Spindler and Swanson put careful thought into preparing for each episode. In addition to reading the research papers in advance, just as they might for any journal club or classroom lecture, they prepare supplementary material such as useful analogies, explanations of techniques or interviews with lead authors. The latter is a popular feature on “TWiM” and was spearheaded by Swanson as a way to demystify laboratory research (and researchers) for the public. It was “heartening,” Swanson added, to hear U-M President Mark Schlissel encourage microbiologists gathered at U-M for the 2015 Michigan Meeting to engage with the public. The 2016 Michigan Meeting on microbiomes was live-blogged and live-tweeted by U-M graduate students. Together, the podcast series, collectively called “TWiX,” now boasts 10,000 or more downloads per episode, and more than 4 million lifetime downloads combined. An extensive number of topics covered by the “TWiX” team comprise curiosities of the microbial world, such as the ocelloid, a unicellular organism with an eye-like structure, or sea star viruses. Other episodes are relevant to clinical medicine and public health — including interviews with Ebola responders; new research on prominent pathogens; and how vaccines work (or fail to work). Several go-rounds have been dedicated to careers in microbiology. Recently, episodes were recorded live at U-M to celebrate the dedication of the Department of Microbiology and Immunology as a Milestones in Microbiology historical site by the American Society for Microbiology. Working on the podcasts, whatever the topic, provides an opportunity to stay abreast of new research while honing their teaching skills, Spindler and Swanson agree. It also improves their ability as educators to communicate science to non-specialists. Ultimately, the opportunity to share with the public about the excitement and value of basic research is what keeps the hosts coming back to record. Suggested starting episodes include: “TWiV”: #368, #315, #341, #323, #355; “TWiM”: #103, #62, #104, #70, #114.